Caveland is nested in an old 18th century winery. 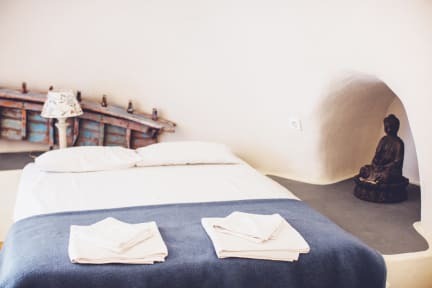 We are situated in the heart of Santorini island, just 20 minutes walk or 3 minutes drive from the beautiful and atmospheric capital of the island called Fira Town. Our village is called Karterados and it is one of the most picturesque and traditional villages on the island with real well preserved cave houses, grandmothers sitting in their yards and grandfathers riding their donkeys! Our complex consists of 8 traditional caves and numerous sea view terraces with a big pool area and gardens. We have a big communal kitchen that you can use for preparation of your own meals, bookshelves if you want to borrow a book and a donation-based coffee corner. Breakfast and wireless internet is included. From May, you can book with us volcano trips or reserve paid port/airport transfer. 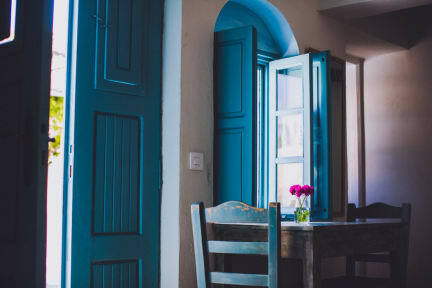 Ideal visit to Santorini is 3 nights. We are located 10 minutes walk from the bus stop in Karterados (Zotos Bakery) which is the second last stop before Fira town or the first stop after Fira. All the busses heading to the South of the island (Perissa, Akrotiri, Kamari) pass this stop and it is really easy to get around. Bring your driving license with you, it is good to rent a quad bike or a car and see the hidden spots of the island! Let us know your arrival times. If you are arriving late night/early in the morning, you need to book the bed for that particular night. We will then prepare your room/bed and you will be able to go to your room even if you are arriving very late. Free luggage storage, usage of communal kitchen, pool and internet/computer before your check in and also after your check out. + beautiful hostel + breakfast + pool + very social hostel + helpful staff + hostel dogs :) + supermarket near by + you can easily walk to fira If you travel by plane make sure to walk to the airport. You’ll walk along a black beach.. you‘ll probably have the whole beach for yourself. It‘s super beautiful. Super Location, gemütliche und tolle Atmossphäre, Blick aufs Meer, Pool, prima Frühstück... genialer Ort zum Entspannen und einfach Sein!!! Wir, 2 Erwachsene und 2 Kinder (8 und 10 Jahre), waren total begeistert. Bitte so bleiben!!! Caveland was one of the best hostels I‘ve stayed in. Nice, clean and spacious rooms, beautiful place, relaxing atmosphere and the best hostel staff ever! Beautiful hostel, the double room was huge and lovely decorated. Very cool and relaxed atmosphere. We loved it there! Very good place. Very beautiful. l liked it. Caveland ist ein sehr schönes Hostel. Die Schlafsäle sind geräumig und das Grundstück malerisch. Einziger Makel: am ersten Tag spazierte ich aus der Tür, die mit "Beach" beschrieben war und nach ca. 30 Minuten fand ich einen leider sehr dreckigen Strand, voll von Müll und z.T. von Bauarbeiten betroffen. Ich hatte hierzu allerdings im Hostel nicht zuvor gefragt und nehme an, dass auch dieser Strandstreifen zur Saison hin aufgeräumt wird und dann sehr schön ist. Good place for a stay and nice atmoshpere to hang around in the evening. You will have to walk for a couple of minutes to get to the bus station to go anywhere. Caveland is a cool place to stay in Santorin. It's situated in Karterados, as Santorin is a small island you can get everywhere easily. It's perfect for backpackers, great staff and many cool people staying here from all of the world. The breakfast is good and always fresh. We liked our stay here, the bathrooms take some getting used to, simply because freshwater supply on the island is a general issue. Thanks for a great stay !